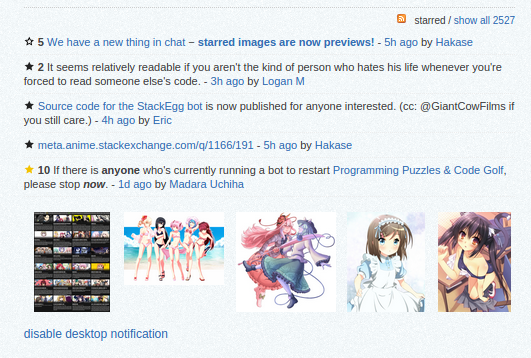 This handy little userscript will turn images starred in chat into little thumbnails under the star list. Oneboxed images in chat will become thumbnails. Add or remove stars normally. The star button appears on hover. Linked images in the form of [text](image link) (assuming nothing else on the message) will become thumbnails with text being a title on the image. Accepting suggestions in answers below. You can find the repository that holds the code can be found here. To install, you must be able to run user scripts. Chrome does this by default (or with Tampermonkey) and Firefox does this with Greasemonkey. Please note that this is still under development, and not all features are guaranteed to work properly. If you have features, suggestions, bugs, ideas, rants, chickens, praise to the almighty Madara-sama, or anything else you'd like to say, feel free to post an answer below, or open a ticket here.